If you have a loved one in your family that needs attentive 24-hour care, it is natural to want to provide them with as much help as possible. However, it is very difficult for family members to provide care for their loved ones 24 hours a day, especially if they have jobs and children of their own to worry about. Fortunately, there are options for families that need 24-hour attentive care for elderly family members or loved ones with disabilities. At Assisting Hands, we provide 24-hour home care services to help senior citizens and adults with disabilities who need round-the-clock attentive care. Our 24-hour care services are ideal for senior citizens with limited mobility, those who suffer from dementia or Alzheimer’s, people recovering from surgery or illness, and seniors that need hospice care. When you contact Assisting Hands for 24-hour care, you can rest assured knowing that we will always have one of our highly trained caregivers present and awake to help with basic care and any emergency situations that arise. Our caregivers will help keep your loved ones comfortable and provide emotional support, as well as quality, attentive care. Attentive 24-Hour Care: Our team of caregivers can provide consistent care and companionship for your loved ones to help their physical and emotional well-being. We are committed to keeping your loved ones comfortable and making sure that every need is taken care of without them having to ask. Three caregivers are sent to the home with our 24-hour attentive care services and they work in shifts to guarantee that someone is always awake and ready to provide emergency care. Overnight Care: If you have a family caregiver that cares for your loved ones during the day but needs extra help at night, we can provide assistance with our overnight care services. One of our caregivers will come to the home each night and stay awake to provide care so the family caregiver can sleep. Live-In Care: If you would like a caregiver at the home of your loved one 24 hours a day, but they do not need 24-hour attentive care, we can help with our live-in care services. Our caregiver will stay in the home for several days and sleep at night, but they are there 24 hours a day in case of an emergency. Having an elderly or disabled family member that needs 24-hour care is quite stressful and it is nearly impossible for families to provide constant round-the-clock care without additional help. 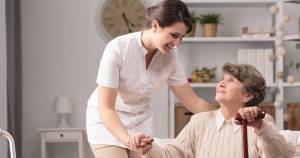 Assisting Hands can provide peace of mind to your family with our attentive 24-hour home care services. You can learn more about our 24-hour care options by talking to one of our professionals. Servicing Chicago and its suburbs – call (847) 915-6186. Aging is inevitable. Staying healthy while growing older is a choice. Seniors who strive to live out their golden years with vigor have several opportunities to do so. Tweaks in lifestyle help elderly individuals stay physically fit, mentally alert and independent, as much as possible. Here are some tips for healthy aging: 1. Get Moving!